The blade is full hollow and blade finishing includes 24k gold brand stamping on the blade. 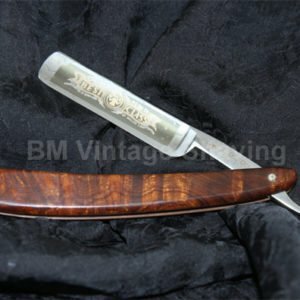 This straight razor from Dovo, experts in the industry since 1906, comprised of a 5/8 carbon steel blade set in an authentic natural bone handle, dyed and permanently sealed against moisture. The all natural handle material assures that no two razors are alike. It will provide the finest shave possible for many generations to come.